I was trying to describe to Sebastian this morning how I feel when I near a pilgrimage destination on foot. It’s happened all four times on the way to Santiago. I feel like I’m walking downhill and the forces of momentum and gravity are carrying me forward beyond my ability to control. When the end goal is less than a day away — even perhaps 40+ kilometres (25+ miles) — I can’t seem to stop. I have to go until I get there, no matter the cost. I was trying to explain that this morning as Sebastian was trying to tell me in his kind way that I was stupid for wanting to walk all the way to Rome yesterday. We’d just finished a 28 km day. Why would I want to walk another 30 km right after? When I woke up this morning, 15 km shy of Rome, there it was — that pull. I’d managed to subdue it yesterday, and wait with my friends to walk the remaining 15 km, but it expressed itself today in an almost manic happiness at breakfast, followed by a blistering pace with me in the lead for our first kilometers. 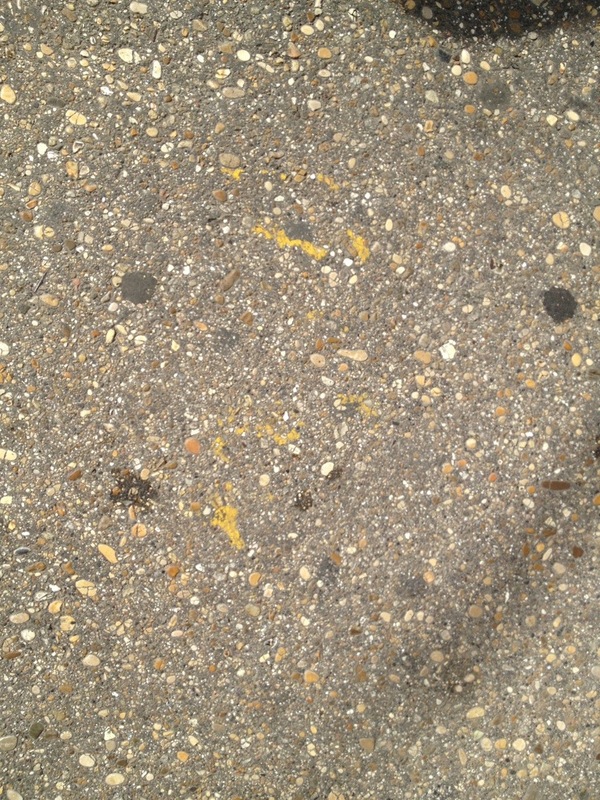 We set out at 9:00 from our B&B in Monte Sacro and found our first waymark, a pitifully worn yellow marker on the sidewalk of the street corner a few blocks away. These painted waymarks usually are two squares, side by side, one with the image of St Peter’s keys, the other with the image of San Francesco’s hands lifted to the stars and birds. This pitiful waymark had definitely seen better days, but finding it was one of many little victories today that ended up leading us directly to the Vatican. 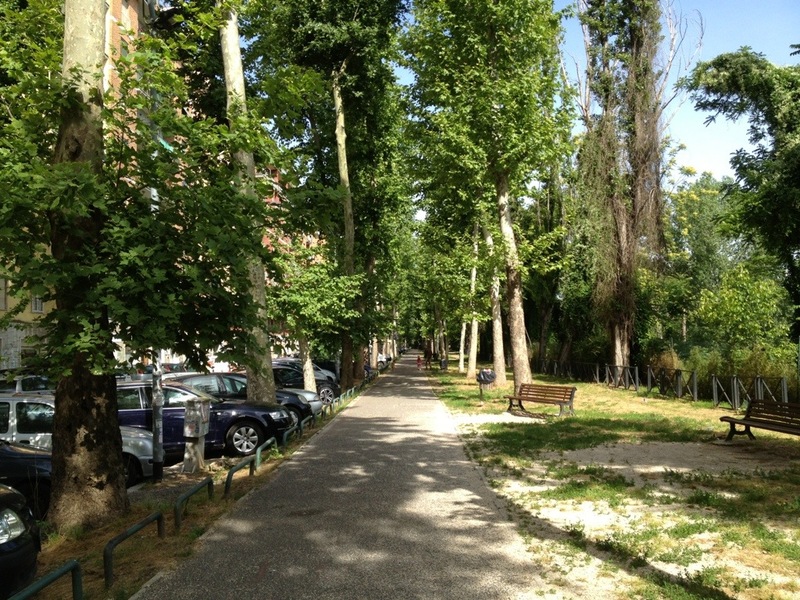 Whoever planned the pilgrim track into Rome clearly had a specific idea in mind — keep pilgrims near the parks and away from the traffic. That is precisely what they accomplished. Our path from Monte Sacro all the way to the Vatican was like a surgeon slicing through flesh but missing every vital organ. 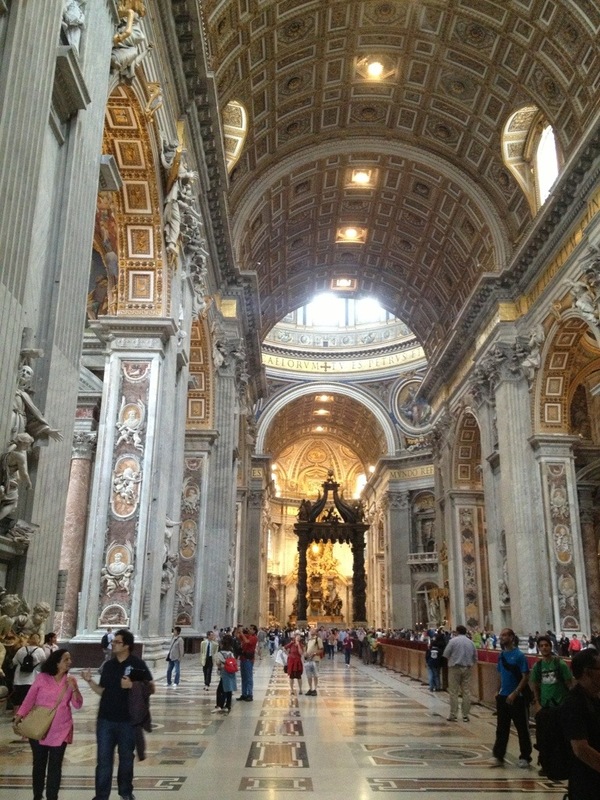 The very first Roman monument we would see, after walking all the way through the Eternal City, was St Peter’s Basilica. No Victor Emmanuel, no Pantheon, no Coliseum, no Spanish Steps. 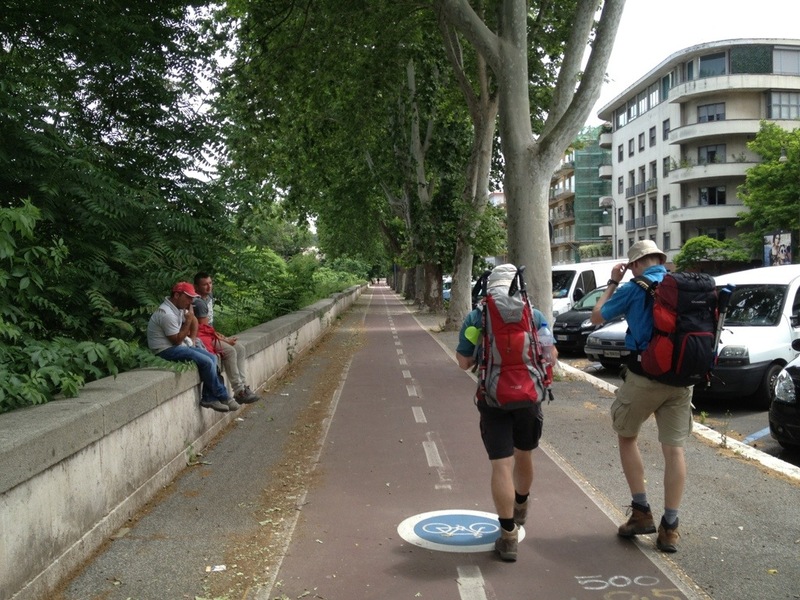 This neat task was accomplished by keeping us on a bike path past two huge Roman parks, then hugging the river as it winds its way through the city. We marked our progress by counting parks and bridges, and then in one surprising moment we looked across a riverbend and behold!, the Vatican. Gravity won, the inevitable, irresistible pull had tugged us to the goal. We had arrived — a day later than I might have if I’d been walking alone, but we had arrived, and together which is really the best way of all. 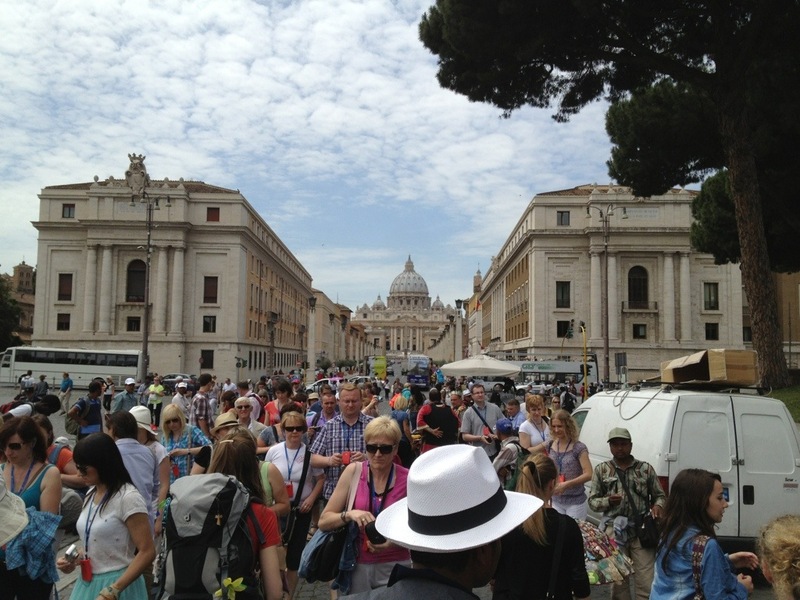 The huge and diverse crowds around the entry to St Peter’s Square could not delay us as we elbowed our way toward our goal. As we stood in awe before the immense building we heard the sounds of English being spoken and asked for our photos to be taken before the church facade. Then we dropped our backpacks off at our nearby housing and returned to secure our final credential stamps and inspect the site. After 30 minutes in the security line we were inside the Basilica, looking at our amazing surroundings then looking for the Sacristy where we would get our credential stamps. 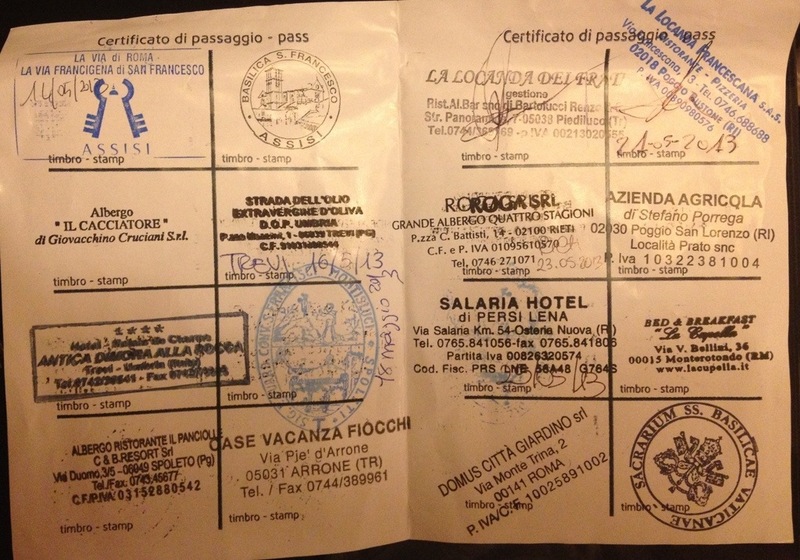 We were led back to a grand and ornate room where a man behind a desk stamped our pilgrim passports, then we headed out of the church to find where to get our “Testimonium,” the official completion certificate. We finally discovered the “afternoon location” of the office and, after our credentials were inspected, were assured our certificates would soon be in the mail. That left us an afternoon to relax and then our first of three evenings to enjoy the cuisine of this great city. Tomorrow we will go to the Pantheon, the Spanish Steps, the Victor Emmanuel Monument, the Coliseum, to my friend AJ’s community of scholars, and most importantly we will visit the Church of St John at the Lateran. This is where Francis of Assisi concluded his original Roman pilgrimage with his audience with the Pope and it is where we will pray and give our thanks and meditate on this amazing two weeks of walking in the footsteps of the simple man of Assisi. This beautiful church was always on my list to see. Welcome to Caminoist. I'm Sanford "Sandy" Brown and these pages describe some of the over 7,000 kilometers I've walked on European pilgrimage trails. Buen camino! John Brierley Guidebooks Top English guidebooks to several caminos. 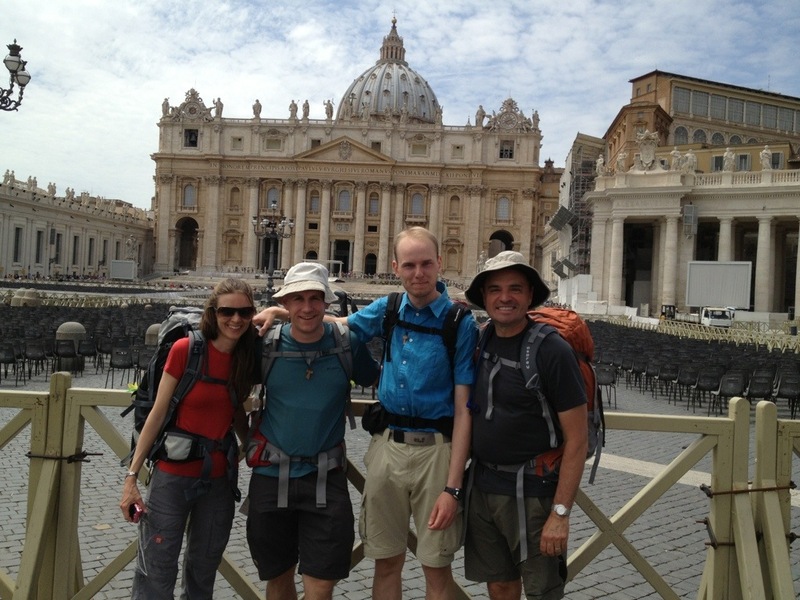 UK Camino Forum Comprehensive advice for pilgrims from a great community of people.